Below, for comparison, are collective images of the bolts for the .22-inch RF Rifles Nos. 5, 6, 7 (British), 8 & 9. The C No.7 (Canadian) bolt is more or less identical to that of the Royal Navy issue N.9 (No.9) rifle. The No. 5 and follow-on No.7 rifles' bolt-heads were longer to permit their use with the respective five round magazines with which these rifles were fitted. The No.6 rifle used an 11mm longer bolt-head than the No.5 but, although that bolt-head was of the same cross-section that would enable magazine feeding, the No.6 rifle was fitted with a single-shot loading platform sprung from below by a leaf-spring rivetted to a base-plate in the magazine-well similar to that of the No.8 rifle. Both the No.8 and N.9 rifles were designed as single-shot, the No.8 having a fixed loading platform, and the N.9 just an empty magazine shell, akin to the original S.M.L.E. training rifles. The N.9 bolt and bolt-head (along with that of the Canadian C No.7 rifle ) is effectively the same as used on all the .303 rifles, modified with the offset free-floating firing-pin of the earlier .22RF "Long--Lee" and S.M.L.E. rifles. 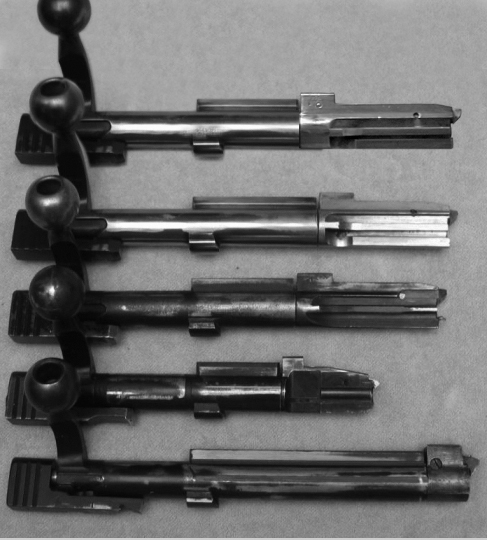 With these bolts, the only differences from the full-bore units were in the striker (shortened), the firing-pin (a separate unit) and the offset of the firing-pin hole for the rimfire cartridge. The conversions of the No.4 rifle, to the various rimfire training rifles, obviously used the later bolt body with the lightened upper/right lug rib. The S.M.L.E. (Short Magazine Lee-Enfield) rifle conversions all used the earlier bolt-body with the solid rib and usually the earlier cocking piece, although many of these have subsequently been replaced by later items. The .22RF No.6 rifle bolt was all but identical to that of the .22RF No.5 trials rifle, only 11mm longer. The bolt for the Canadian C No.7 rifle, unlike that for the British No.7 rifle for the Royal Air Force, was, to all intents and purposes, identical to that of the Rifle N.9 (No.9) for the Royal Navy. The N.9 rifle was the last of the line of Lee-actioned rifles, and its bolt-head still bore the closest resemblance to that of the turn of the Century (Ninetenth to Twentieth) Lee-Metford, Lee- Enfield and Lee-Speed rifles and carbines, although the Lee-Enfield No.1 Mark I (the first mark of SMLE ) used a bolt-head with a sliding magazine clip charger block, the precursor to the Charger Loading Lee-Enfield (the "Long Lee- see as a LLE .22 conversion for training"). The overall short length of the No.8 bolt is due to its designed purpose of reducing the bolt travel and lock-time for that rifle which, in addition to performing the task of a training rifle, was additionally intended to serve as a target rifle. This was acheived by carrying the chamber section of the barrel rearwards into the receiver - obviously by the distance equivalent to the difference in length between the No.8 and No.9 bolt lengths. 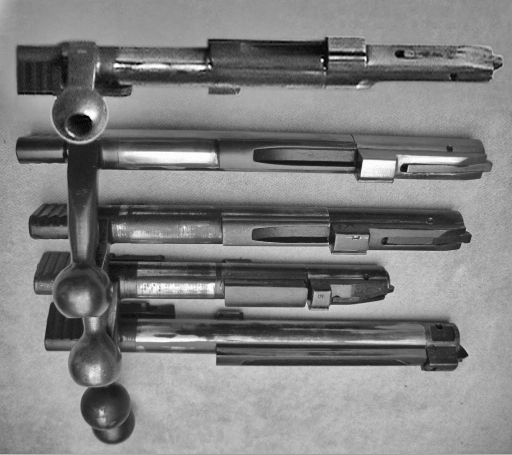 The reduction in "lock" time was also gained by the significant re-design of the trigger assembly (see Enfield Rifle No.8) - this is the time between pulling the trigger, releasing the sear and consequently the firing-pin onto the cartridge primer, - thus improving the capability of the rifle for target shooting, where any reduction in time between pulling the trigger and the firing of the cartridge also reduces the chance of disturbance of the line of the rifle between the barrel and the point of aim. Such advantages may only be measured in milleseconds, but designers of all firearms, not only target rifles, have been involved in a quest to acheive this infinitessimal, but vital, goal since the trigger was first invented.